of Honor" on May 27, 2012. Over 2 years of hard work and planning culminated in the revealing of the "Trails of Honor" Eagle which features a wooden wagon wheel with 6 stars representing the 6 major armed services. Veterans from the Macedonia area were honored with engraved bricks set in the floor of monument. Sue McCready, Chairman of the Eagle Committee, welcomed the guests to the dedication. Pastor Bruce Smith, Macedonia United Methodist Church, gave the Invocation. A Civil War Color Guard with individuals from Company B, 10th Iowa Volunteer Infantry Sons of Veterans Reserve (SVR) and Sons of Union Veterans of the Civil War (SUVCW) presented the Colors. A wreath was placed at the base of the monument by Max Bisbee, American Legion Post 648 Commander. Carol Forristall sang the National Anthem. James Braden, Sr., former Mayor and Eagle Committee Member, introduced Special Guests. Melvin Houser, Pottawattamie County Board of Supervisors and Terry Pullen, Mayor of Macedonia, thanked all those who worked to make the Monument a success. founding fathers said 'all men are created equal and are endowed by their Creator with certain inalienable rights; that among them are life, liberty and the pursuit of happiness', lawyers defend these rights in courts of law, but I submit that it was the soldiers, airmen, marines, sailors and coast guardsmen of this nation that have enforced it". "Freedom has never been free; it has been defended and paid for by our Macedonia veterans and others veterans throughout our nation." Mr. Slocom is a native of Macedonia and currently lives in Sumter, South Carolina. Ruby Bentley, Macedonia Historical Preservation Society, read the proposed educational plaque. Michael Antunez played taps as the colors were retired. A Civil War canon shot closed the official ceremony with a bang. Coffee and cookies were served by the American Legion Auxiliary at the DeWitt Community Center in Macedonia. committee, but especially, Sue McCready, Chairman, and Richard "Skip" Raney and Wong Antunez for overseeing the project and "getting it right". The project was funded by a Grant from the Pottawattamie Board of Supervisors and by numerous community fundraising projects. Thank you to all who contributed. Our next fundraiser will be a Poker Run on June 16 which will begin at the Back Forty in Macedonia. 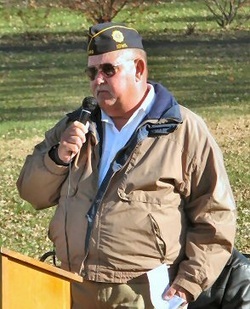 By Eileen Adickes -- Macedonia’s history was further etched on Friday, November 11, 2011 as folks gathered in the school park to take part in the groundbreaking ceremony for the Eagle of Honor Veterans Monument. Eagle of Honor Monument Committee Chair, Sue McCready welcomed those assembled on an unusually warm November afternoon. Pastor Bruce Smith of the Macedonia United Methodist Church prayed. The Civil War Color Guard comprised of Sons of Union Veterans of the Civil War posted the colors in an impressive display and wearing their Civil War period uniforms. Max Bisbee, Legion Post 648 Commander, placed a wreath at the base of the flag pole from which flew a flag donated by Woodmen of the World Lodge 6011. Greg and Carol Forristall led the singing of our National Anthem. James Braden, Sr. assumed the podium and introduced the following speakers: Melvyn Houser, Pottawattamie County Board of Supervisors; Russ Christensen, Eagle Monument Artist; Darlene McMartin, Iowa Commission of Veterans Affairs; Irene Wilson, Woodmen of the World; Terry Pullen, Mayor of Macedonia; Dr. James Sutton, Superintendent of Riverside Community Schools. Three of the four Freedom Essay contest winners read their essays: Lindsey White, Maxwell Farver and Samantha Keast. Anna Hildebrand was a winner, but was visiting a college. 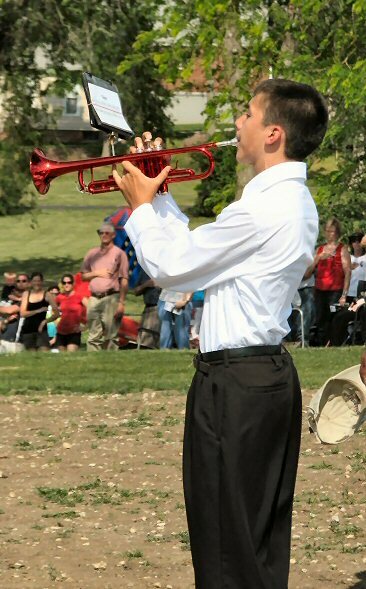 Following the retirement of the colors, Michael Antunez, a Riverside student, played taps. Six gold painted shovels were used by Sue McCready, Terry Pullen, Melvyn Houser, Russ Christensen, Susan Goos and Skip Raney to symbolize the groundbreaking for the monument which will be installed next spring. You have a unique opportunity to assist the town where you grew up. Macedonia is seeking to beautify the town by creating a park and monument honoring Macedonia's war veterans. The park is planned for the area between the city park and the softball field; the former location of the Macedonia School Building. Local artists have drawn up plans for this undertaking and residents of Macedonia have made some contributions. The Pottawattamie County Board of Supervisors has purchased an eagle monument and the base for each town that participates in this effort. It is up to each town to create a display area for the monument to our brave and departed war veterans. Please consider how your donation can assist with the creation of this park and monument that is hoped to encourage tourism and more interest in Macedonia. We encourage you to return to your roots and help to preserve the memories here. Thank you for your consideration and your donation.